We're really approachable. If your question is not answered here, please ring or email and we'll answer quickly. Or better still, come and see for yourself. You're welcome to wander round the Wharf at any time, and we can easily arrange to show you round any available units at a time to suit you. There is plenty of parking on site. You will have a limited number of designated spaces, but in practice the space is shared between tenants and visitors without difficulty. What's covered by the service charge? External maintenance and repainting. Fire alarm (where fitted) maintenance. Gardening. We have a bulk policy which covers your building and loss of rent. You pay your share of the premium. Your fittings and equipment are not covered by this policy, so you should arrange your own insurance. Do we have to put up a Bond? Normally, no. Rent is payable monthly in advance. How long will our lease be for? That's up to you. We can do periods from 6 months to 15 years. We issue a very short, simple lease based on a Law Society template. Leases are subject to approval by our landlord, Canal & River Trust, which is quickly given. 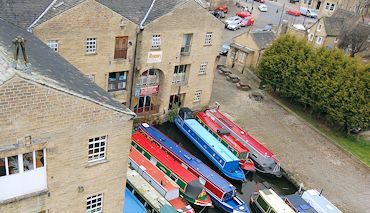 Sowerby Bridge Wharf is just off the A58 near the centre of Sowerrby Bridge, which is near Halifax in West Yorkshire. We are 15 minutes from the M62 (junction 22 or 24). For a map, see our contacts page.